Heavy rain and snowfall is observed all over the country from 2 Feb to 5 Feb. Khyber Pakhtoonkhwa and Punjab districts or declared heavy rain and snow. 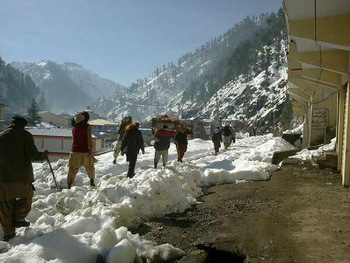 Specially, Galiat side, Northern areas, Swat, Shangla, and Overall upper Malakand Agency have been observed heavy snowfall and havoc’s of rain. The heavy snowfall and rain shoddily affect the houses and people in many areas in the country, collateral damages were reported. 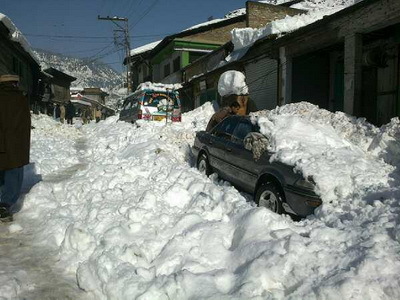 As the rain and snowfall break the records of last decades only in Swat (Malamjaba reported 10 feet snowfall. Kalam and other adjacent areas districts Dir (upper, lowari top) Shangla (Shangla top Alpurai Tehsil, Yekh Tangai, Puran side are closed from last 4-6 days, people are very much suffering. During our general information provided by some local people and information collected from different departments almost 50% area and people of Shangla district is affected in some way or other. Means of communication, like inaccessibility to market, hospital, telephone, electricity are still not open and accessible to people. The Union Council which are reported heavy snowfall and reported damages, (causalities, land loss, livelihood loss, damages of houses due to rain, land sliding, snow avalanches etc) are as (Alpuri, Lilowni, Malak Khel, Pirabad, Dehrai, Kuz Kana, Shahpur, Damorai & Pirkhana). The detailed assessment is started in some areas where people have access, the detailed will come sooner and may share for urgent response and financial assistance from UN, International and National humanitarian organization. Reblogged this on Sustainable Development Society (SDS).